All we know of the mythical Bigfoot is a famously-indistinct strolling blur, and as such the legend of the sasquatch remains. In Found Bigfootage, you play as that strolling blur, making sure invasive camera-wielders get anough footage to leave you alone, but that none of it is clear. 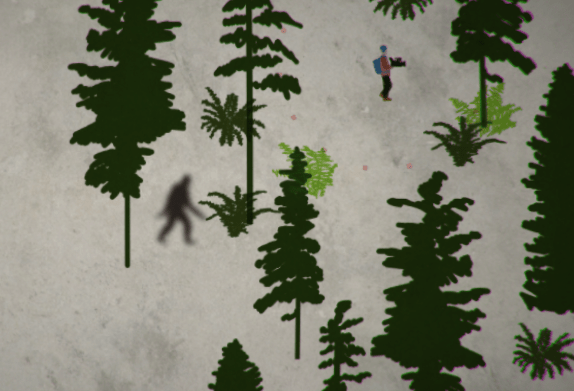 Developer BluShine made the "reverse stealth game" in just 48 hours—I love how even with so little time, the developer managed to get the twangly, remote-forest aesthetics any sasquatch-hunter could hope for. Found Bigfootage was made for Ludum Dare 33, whose "You are the Monster" theme has been interpreted in all kinds of ways: You can work for a form letter company, weigh human life as a refugee smuggler, or generally be a misanthrope.